Drive safely, conveniently and in style with Amkette Capio S80x premium car mount. 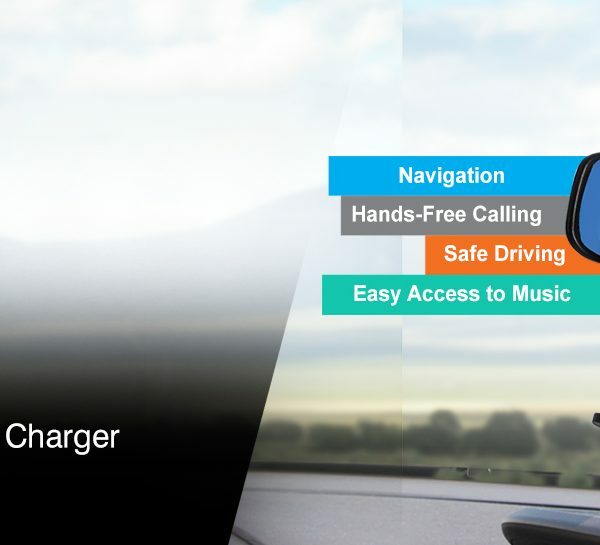 This is the ideal and safest solution for In-car smartphone use and helps in converting your smartphone into a GPS navigation device and encourages safe driving. Capio S80X uses a high quality sticky gel on the suction pad for extra secure dashboard and windshield mounting. The 360 degree rotational cradle means optimal viewing and the super suction pad with 3M disc allows you to securely mount on the dashboard. Amkette Capio S80x comes with a high quality sticky Gel on the suction pad for extra secure dashboard and windshield mounting. Sticky Plus uses a high quality washable and reusable gel which provides same suction strength after every single wash. The Amkette Capio S80x is made of high quality ABS plastic and has a premium soft touch matte finish on its body. The premium looks will surely enhance the interiors of your car. The Amkette Capio S80x car mount has a quick release cradle which opens with a single button press from the back of the cradle. The cradle can easily hold smartphone upto 6” inches in screen size. Capio S80x car mount is perfectly compatible with all latest smartphones iPhone 6S, iPhone 6s Plus, Nexus 6, Nexus 6P, Nexus 5X, Samsung Galaxy S7, Samsung Galaxy S7 Edge, Samsung Galaxy S6, Samsung Galaxy S6 Edge, Moto X Force, Moto X Play, Xiaomi Red Mi Note, Mi4 and all the other trending smartphones. Amkette Capio S80 X car mount has a 360 degree rotational cradle mount. This enables landscape and portrait orientation of the device and subsequently easier for the driver in viewing while driving. Amkette S80x Capio Car mount has a cradle size of 53 mm to 83 mm. It means that it can hold all the Smartphones having a screen size of up to 15 cm (i.e. 6 inches) diagonally. This covers all the latest Smartphones like Samsung Galaxy S7, Samsung Galaxy S7 Edge, Samsung Galaxy S6, Samsung Galaxy S6 Edge, Moto X Force, Moto X Play, Xiaomi Red Mi Note, Mi4 and all the other trending smartphones. Amkette Capio S80x car mount comes with a 3M disc for secure dashboard mounting. The 3M disc uses high-quality adhesive which holds the car mount firmly and provides perfect grip on the dashboard surface area.